Udi Glaser is a composer (film composer, composer for theatre, etc. ), an accomplished guitarist, educated musician, producer, experienced guitar teacher, music theory tutor and journalist. Udi has dedicated his life to music. Since picking up a guitar at the age of 13, he has gone on to attain a B.A. in Musicology and a Sound Engineering diploma. He also completed a specialist certificate in Orchestrating and Producing Music for Film and Games from Berklee college. For this certificate, Udi was granted a scholarship in the name of Jeff Beck, the well known guitarist. Udi has also been teaching music and guitar both as a private tutor and in music schools and centres for the past 13 years. He is currently involved in different music projects and composing original music for a wide array of film genres and theatre plays. 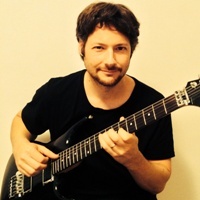 Udi Glaser offers guitar lessons in North and Central London. Udi is an experienced guitar teacher who has been teaching since 2002 in local schools and giving private and group guitar lessons. He is a registered guitar teacher as a member of RGT@LCM – Registry of Guitar Tutors at London College of Music. Among his students are well known celebrities. Since he picked up a guitar in 1991, Udi has also gained experience on stage as a performing guitarist and in the studio as a session player and recording artist. Udi’s previous studies include a B.A. in Musicology, a Diploma in Sound Control and a Certificate in Orchestrating and Producing Music for Film and Games, for which he was granted a scholarship in the name of Jeff Beck, the well known guitarist. Guitar lessons take place in his home studio in north London – Crouch End, Highgate area. Udi teaches all levels including beginners and covers a vast range of guitar styles and genres, such as: Classical guitar, Pop, Rock, Metal, Blues, Spanish guitar, Ethnic and World Music and many more. Udi also teaches how to use the correct technique when playing guitar, improvise, compose on the guitar, music theory, sight reading, TAB reading and every little thing a guitarist should know. * For an additional fee, Udi also gives guitar lessons on Sunday and guitar lessons in and around London at the comfort your own home. A listing on London Music Teachers does not imply our recommendation or endorsement. It is your responsibility to verify music teacher or accompanist registration and music teacher or accompanist security details.